As the premier transportation service provider in the Twin Cities, we proudly serve the entire 7-county metro area and beyond. We pick up and drive to anywhere in Anoka, Carver, Dakota, Hennepin, Ramsey, Scott, and Washington Counties. We also provide transportation services for parts of Wright, Sherburne, and Isanti Counties. Whether you need an airport taxi in St. Paul or black car service to Minneapolis, we have a ride ready for you. Need a ride outside our service area? 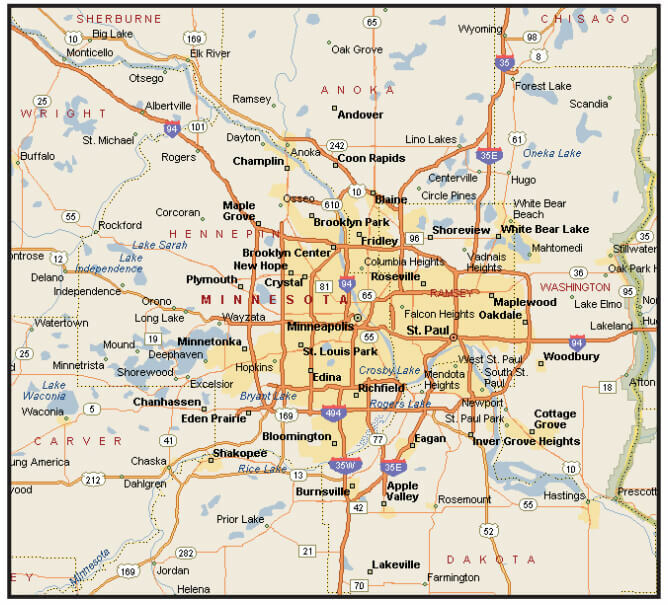 We can take you from the Greater Twin Cities to almost anywhere you want to go including Duluth, Rochester, St. Cloud and Mankato. We can also pick you up from outside our service area and give you a ride back to the Greater Twin Cities, but you will need to arrange for a prepaid ride. Please refer to our Payment Options page for more information on arranging a prepaid ride. Give us a call at 612-888-8888 and find out if we can pick you up.